Jigger, Shaker Classic/Boston, Strainer, Wine Glass. Shake with ice all the Ingredients except the Juice, Cream and the Cherry. 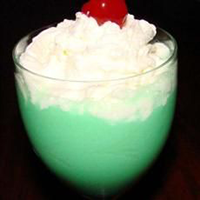 Strain into a Wine Glass, Filled with the Juice, add the Whipped Cream and the Cherry, and serve.